Today marks the 65th anniversary of the detonation of 'Little Boy', the first nuclear warhead in the U.S. arsenal to be used as an act of war, and changing the world upon its use. The bomb, which was followed by 'Fat Man' on August 9th, caused casualties in the hundreds of thousands, with its effects lasting far into the present day. The United States marked a change in policy earlier today when Ambassador John Roos attended the reemergence ceremony earlier today. The onset of nuclear warfare marked a massive change in the structure and hierarchy of the world. The culmination of the Manhattan Project and the subsequent implementation of nuclear arms into the U.S. arsenal was the result of years of work and research on the part of the United States, and one that remains fiercely debated to this day. The first, and only use of the weapons over Japan sparked much attention, but in and of itself was a single element in a larger strategy that was used to extend U.S. military power abroad. 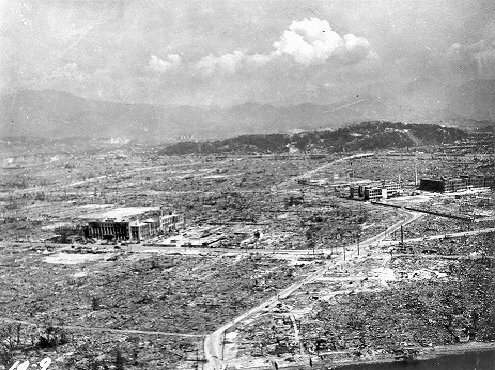 Earlier bombing runs, notably with the switch from conventional explosives to incendiary explosives on the part of the Army Air Force over Japan yielded similar results to the Hiroshima and Nagasaki bombings: a high number of civilian casualties and military targets were directly attacked, killing hundreds of thousands. The nuclear warheads are in and of themselves notable because of the sheer destructive force, and the ease to which an opposing force can destroy a comparable target when examined alongside prior methods. Previously, it required a large bombing force over enemy territory, where planes were susceptible to anti-air craft fire and mechanical breakdown. With a single air craft, the ability to do the same appeared. It would seem that with the smaller force, and ease of destruction, that nuclear warfare would be an inevitable end to civilization as we know it. Large military forces require far more expenditure, logistics and manpower to accomplish their goals, with steep casualty costs, as seen in the casualty rates of the airmen who ventured over Axis-occupied territory during the Second World War. This misses the point, I believe, of the ease of destruction often predicted by science fiction authors. The scary thing itself isn't the bomb itself, but the system in which deploys it. The Second World War industrialized warfare to an incredible degree due to military necessity, and as a single nation almost untouched by war on its own borders, the United States found itself with the manpower, equipment and weapons in which to enforce its will across the world. When the Soviet Union joined the nuclear club, it acted as a balance of power, but one that tread upon very uneasy ground, as the potential for nuclear warfare grew immensely, and teetered on the edge at such moments like the Cuban Missile Crisis. Fortunately, the fears of apocalypse never came to pass: cooler heads prevailed, and the implimentation of strategy that was designed to deter, rather than to destroy outright came to pass, but the introduction of nuclear weapons demonstrated that the balance of power had changed in a profound way: nations could enforce their will through the threat of force, and advances in science and technology allowed for a continued strategy on the part of the countries that were involved in the Cold War. In a real sense, with such advances, the world became a truly global, interconnected place, and affairs that had once been inconsequential now became important to the world as a whole. The Nuclear age arguably never began with the Japan bombings, but earlier, as military strategy attempted to find ways in which to end the threat to U.S. interests. In doing so, unprecedented measures were undertaken: cities were destroyed, in what can be looked at as the closest thing to apocalypse and speculative fiction one has ever seen, and examining the aftermath provides for some almost surreal accounts: it is no wonder that people believed that the world would end with a flash of light, and it is uncomforting to realize that this sort of threat is one that is ongoing: the Cold War has since ended, but the threat of nuclear power is still one that will exist while such weapons exist, and will undoubtedly continue to influence those who look towards the future. What needs to be determined from policy makers and strategists as to the true risk, and to determine if the stakes are high enough.